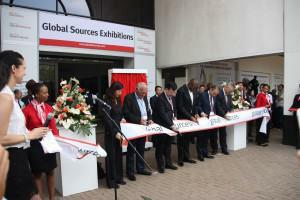 Global Sources opened its sixth annual Global Sources Exhibition South Africa on Thursday 12 November in Johannesburg, connecting African buyers with quality suppliers from Greater China. Buyers were able to source a range of products including electronics, home products as well as hardware and building materials to name a few, across 400 exhibitors. Trade volume between China and Africa is expected to double by 2020. China has already become Africa’s biggest economic partner with trade expected to reach US$400 billion by 2020, up from US$200 billion in 2013, which make this expo very relevant. “Africa’s trade with China continues to expand. Sustained demand for China-made consumer goods is playing an increasingly important role in African retail markets – providing consumers with more choices for quality products. Global Sources is strategically positioned to facilitate this accelerating trade relationship between both continents. Our show in Johannesburg is an ideal platform for business people in South Africa and throughout continental Africa to meet directly with manufacturers and find the right products for their home markets,” said Spenser Au, CEO of Global Sources at the exhibition opening.